With this product you can accumulate up to 233 Glitter Points. 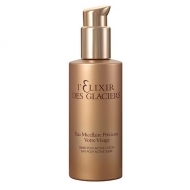 DESCRIPTION: Elixir Des Glaciers Vos Yeux from Valmont is an anti-eye cream. A subtle arm of seduction and a mirror of our most intimate emotions, the eyes demand immediate attention. The most precious treatment in the world has been enriched with specific ingredients to give the eyes an exceptional creation. 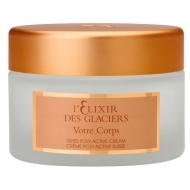 Its creamy texture illuminates the eye area: the appearance of fine lines and wrinkles is reduced; dark circles and stares are dimmed, and the eyes shine with renewed radiance. This regenerating eye cream with a delicate and penetrating texture contains a unique formula designed for high performance. Triple DNA enhances the power of cellular DNA regimentation and adds spectacular benefits of the mineral to allow for an efficient and long-lasting fight against the visible signs of time. 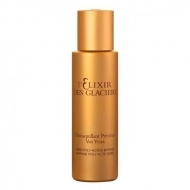 The unique formula was enriched with the peculiar agents: 20% Glacial Spring Water, pure plant extracts from the Phyto-Alpine garden and RNA (molecule that acts as a powerful bio-activator of the cells). Triple DNA obtained from wild salmon combined with three macro elements (magnesium, calcium and sodium) releases highly potent properties such as hydration, anti oxidation, cell renewal and regeneration. 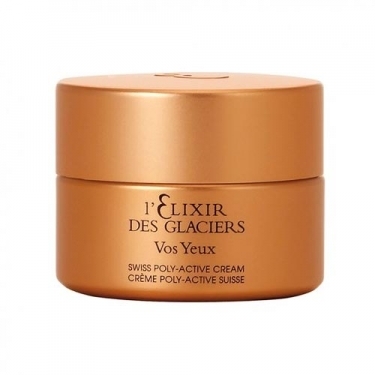 This unctuous cream is designed to lighten the contour of the eyes: Elixir Des Glaciers Vos Yeux removes wrinkles and fine lines while erasing dark circles and unsightly misfortunes to the eyes with renewed luster. 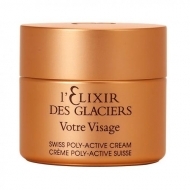 Apply a gentle layer around the eyes in the morning and at night. To ensure the preservation of your divine properties, use between 2 to 3 months after purchase.